As the evenings grow cooler, Emory Jazz Combos offer outdoor jazz concerts on Patterson Green. Free concerts this month are Thursday, Oct. 8, and Thursday, Oct. 22, both at 6 p.m.
1. Eat and learn at the Sustainable Food Fair. Update: Due to inclement weather predictions, the Sustainable Food Fair has been rescheduled to Friday, Oct. 16. Emory's 10th annual Sustainable Food Fair is set for Friday, Oct. 2, from 10:30 a.m. to 1 p.m. at the Cox Hall Bridge. Enjoy educational tables, a farmers market and entertainment showcasing the sustainable food movement in Atlanta. Bring cash to purchase food items; there will be plenty under $10. In case of rain, the event will be held Oct. 16. 2. Enjoy "Four Fast First Fridays" of dance. This series with a tongue-twister title is brought to you by Catellier Dance Projects. Changing the usual choreographic process, Emory dance faculty member Gregory Catellier and his collaborators give themselves only one month to create a brand new dance, culminating in this short, casual performance. The series kicks off Friday, Oct. 2, at 6:45 p.m. in the dance studio at Schwartz Center for Performing Arts. Other performances will take place Nov. 6, Feb. 5 and March 4. Free with no tickets required. 3. Embrace your creativity with old library catalogue cards. "It's in the Cards," an interactive, expanding art exhibit at the Robert W. Woodruff Library, features old library catalog cards transformed into art and poetry. While you can always drop by to pick up a card to decorate, bring your friends for a free Art-Making Open House on Tuesday, Oct. 6, from 4:30-7 p.m. in the Jones Room. The library will supply cards, art supplies, snacks and music as you create your masterpiece to add to the exhibit, which runs through December. 4. Relax with two evenings of Jazz on the Green. 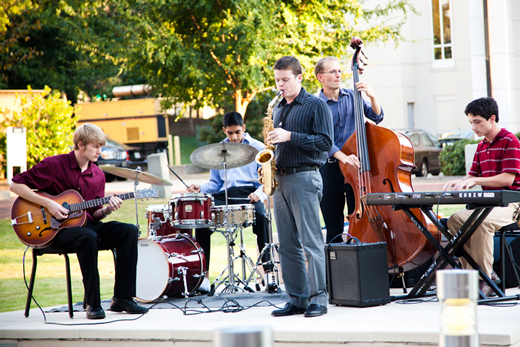 As the evenings grow cooler, Emory Jazz Combos offer outdoor jazz concerts on Patterson Green, located between the Schwartz Center for Performing Arts and Goizueta Business School. Free concerts this month are Thursday, Oct. 8, and Thursday, Oct. 22, both at 6 p.m.
5. Experience the "Indigenous Beauty" of North American native art. "Indigenous Beauty: Masterworks of American Indian Art," the next major exhibit at the Michael C. Carlos Museum, opens Oct. 10 and runs through Jan. 3. Drawn from the celebrated Native American art collection of Charles and Valerie Diker, the exhibit highlights native North American artists whose visionary creativity and technical mastery have helped preserve cultural values across generations. The Carlos Museum has also scheduled a diverse slate of public events related to the exhibit. Museum admission is free for Emory faculty, staff and students. Bringing family or friends? Regular admission is $8 for adults and $6 for other students, seniors and children ages 6-17; children 5 and under are free. 6. Feast on music and the poetry of T.S. Eliot. Plan your lunchtime to coincide with the next installment of the John and Linda Cooke Noontime Series, focused on poet T.S. Eliot's "Four Quartets." Visit the Matheson Reading Room in Candler Library at noon on Oct. 16 as the Vega String Quartet and Eliot expert Ronald Schuchard, Goodrich C. White Professor of English Emeritus, combine talents to celebrate the modernist poet. 7. Revel in writing with the Phillis Wheatley Reading. Hosted by Creative Writing at Emory, this year's Phillis Wheatley Reading features novelist and short-story writer Reginald McKnight, Hamilton Homes Professor at the University of Georgia in Athens and winner of the O. Henry Award, the Drue Heinz Literature Prize, and many others. The free reading is Monday, Oct. 19, at 6:30 p.m. in the Jones Room of Woodruff Library; a reception and book-signing follow. 8. Pick your favorite in the Emory Concerto and Aria Competition. Beautiful music and a bit of competitive spirit take the stage at Schwartz Center for Performing Arts for Emory's annual concerto and aria competition. Emory students showcase their musical gifts and vie for accolades at this free event on Sunday, Oct. 25, at 7 p.m. in Emerson Concert Hall. 9. Take a walk to enjoy fall foliage — and increase your daily steps. Fall transforms the Emory campus into a gorgeous array of colors, from trees on the Quad to greenspaces like Lullwater Preserve and Hahn Woods. It's the perfect time to take a walk, especially if you are participating in the Move More Challenge. To help you get moving, Emory's Faculty Staff Assistance Program lists an assortment of walking groups at multiple locations, including Lullwater and multiple medical campuses. 10. Celebrate Halloween with Emory traditions. Whether your take on Halloween is scholarly or social, Emory has a tradition for you. The month's calendar is still taking shape, so while you watch for more spooky events to be announced, make plans for these annual favorites. The Carlos Museum highlights its mummy collection with two Halloween events. "Mummies and Mixers" on Oct. 29 from 7-9 p.m. focuses on adults, with a movie, snacks and mixology. Admission is free for members and $10 for students; it's a bit more for non-members ($20) and alumni ($15). "Mummies and Milkshakes" on Oct. 30 at 6:30 p.m. is more family-friendly, so come in your Halloween costume to tour the museum's mummies and watch mummy movies. It's free for members and $5 for non-members; milkshakes are sold separately. Also on Oct. 30, the Center for Ethics hosts its annual symposium "Zombethics: A Lively, Scholarly Discussion about the (Un)Dead." Open to students, scholars and the general public, the event features experts from neuroethics, public health, film, disability, religion and more. This year's topic is "Really Most Sincerely Dead: Zombies, Vampires and Ghosts, Oh My!" Attendance is free but registration is required.